Fourmile by Watt Key. Grades 6-8. Farrar, Straus & Giroux, 2012. 228 pages. Review copy provided by publisher for Young Hoosier Book Award consideration. My review reflects only my own opinion, not necessarily the opinion of the committee. Things are a little rough for twelve-year-old Foster right now. Ever since his dad died, the farm he lives on has been slowly falling apart and now his mom says they have to sell it. Foster's not sure what kind of decisions his mom is capable of, though, since she's decided to date Dax, a bully of a man whom Foster instantly disliked. One day as Foster's painting the fence, Gary shows up and things start to change. Gary, a wandering ex-military man, offers to stay and help fix up the farm for minimum wage and a spot in the barn to sleep. Foster takes a shine to Gary who's calm and quiet and capable and seems to understand the pain Foster's still feeling over his dad's death. Though Foster keeps telling himself that Gary will have to move on, he starts to hope that Gary can stay. But Gary is not being completely upfront about his past and as the summer sizzles on, things will come to a blistering head. Foster is a very realistic tween guy that kids will identify with. I completely believed in his confusion after his dad died, his frustration at his mom dating a jerk, and his instant attachment to Gary, a solid father figure. I loved Foster's devotion to his dog (who also doesn't like Dax) and the devotion he discovers he has to his farm. 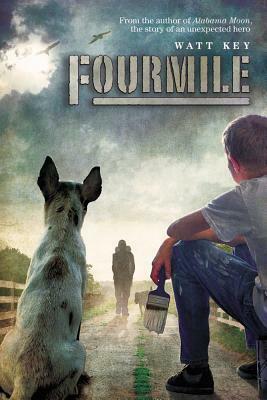 As Gary and Foster begin the process of fixing up the place together, Foster is able to let go of some of the pain he feels over his dad's absence and start to love Fourmile Farm for what it is. Although this is a character-driven story about Foster coming to terms with his dad's death, the story also has a lot of action. Dax is a truly slimy guy and there is a lot of drama surrounding Dax and his mistrust of Gary and his mistreatment of both Foster and his mother. Although some of it felt a little over-the-top, the action blends nicely with the character development to make a story that will capture kids' interest. The story also has a strong sense of setting. Watt Key brings Fourmile Farm to life with descriptions of the fields at different times of day, the rain coming down, the smells of the barn (and how they change as Foster and Gary start fixing things up). As much as this is a story about Foster and an action story, it's also a love letter to a Southern farm. Readalikes: Readers looking for another story of a tween guy dealing with family issues in a rural setting might like Heart of a Shepherd by Rosanne Perry. In the story, Brother is searching for his place and trying to help take care of a ranch when his brothers are off at war. Readers who like the blend of character development and action might like Bull Rider by Suzanne Morgan Williams. Between skateboarding, ranching, and bull riding, there's a lot of action in this book, but the protagonist Cam is also dealing with his brother coming home injured from war. Fourmile was on the shortlist for the Middle Grade Cybils Award and it's also been reviewed by The Boy Reader and A Patchwork of Books. It's on shelves now.